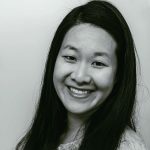 Published Aug 5, 2016 By Julia 2 CommentsThis post may contain affiliate links. 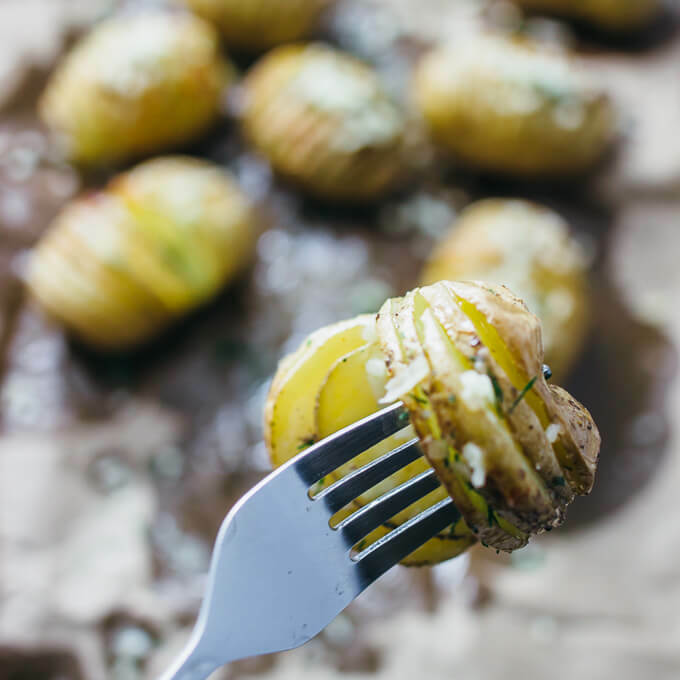 You’ll love these mini hasselback potatoes with cheese that are loaded with parmesan crumbles, herbs, cayenne (of course it’s spicy! ), and butter. 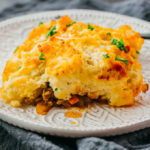 This is an easy and tasty recipe for fast baked potatoes that are as beautiful as they are delicious. 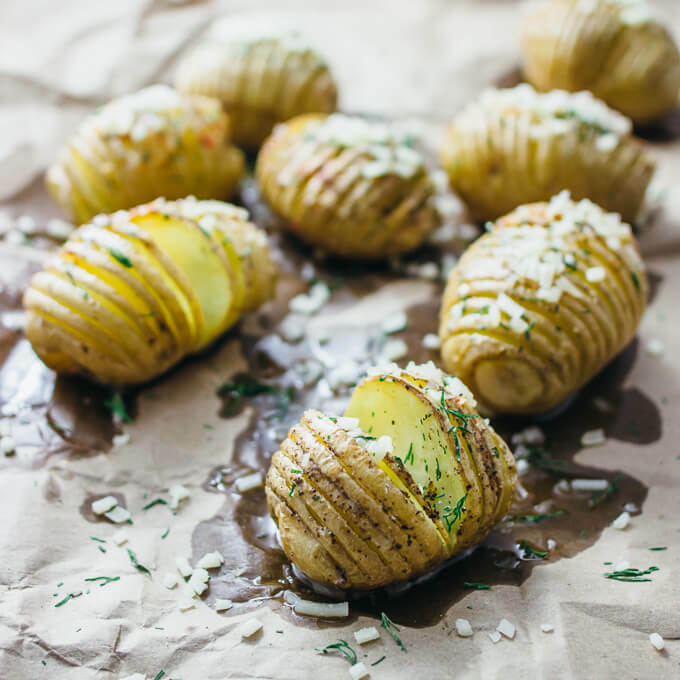 I love hasselback potatoes because they are super tasty and fun to look at. 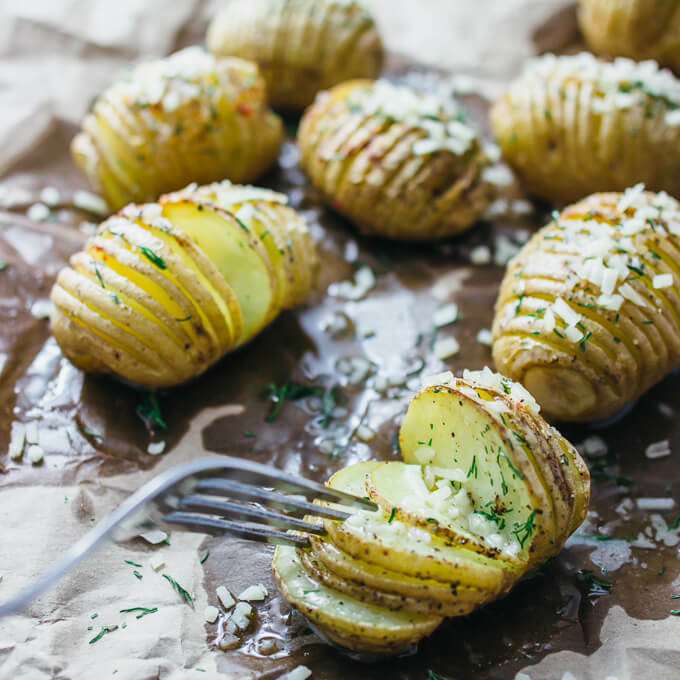 Enjoying these armadillo-looking potatoes is like having all of your potato dreams come true: cheesy potato goodness all scalloped and buttered up with spices and herbs. And I’m using baby potatoes for this recipe, so maybe these should be called hasselback tater tots tassel tots?? Some history: Hasselback potatoes originated in Stockholm in the 1700s, where there is a hotel and restaurant called Scandic Hasselbacken. Watching these hasselback potatoes cook in the oven is kind of mesmerizing: as they bake, the scalloped slices spread out from each other, looking more and more like an armadillo. ? If you don’t want to bake these potatoes, other great options include cooking them on the grill or in the microwave. Maybe adding some bacon, too? I’ve separated the various seasonings for these hasselback potatoes into 2 categories: before and after baking. 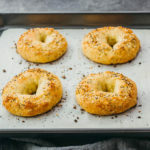 Some stuff (such as salt and pepper) I don’t mind adding to the potatoes before baking, but other flavorings like herbs and parmesan cheese should be added to the potatoes after baking so that they retain their nice texture and color. Simple and straightforward: The recipe only has 3 steps! Just slice, season, and bake. Spicy!! Of course it’s spicy. I added some cayenne for good measure. Vegetarian: This is a great vegetarian appetizer or side dish to make for parties. Cheesy: These potatoes are loaded with lots of parmesan crumbles. And lots of butter. Pretty: Aesthetically pleasing dishes are always a win. 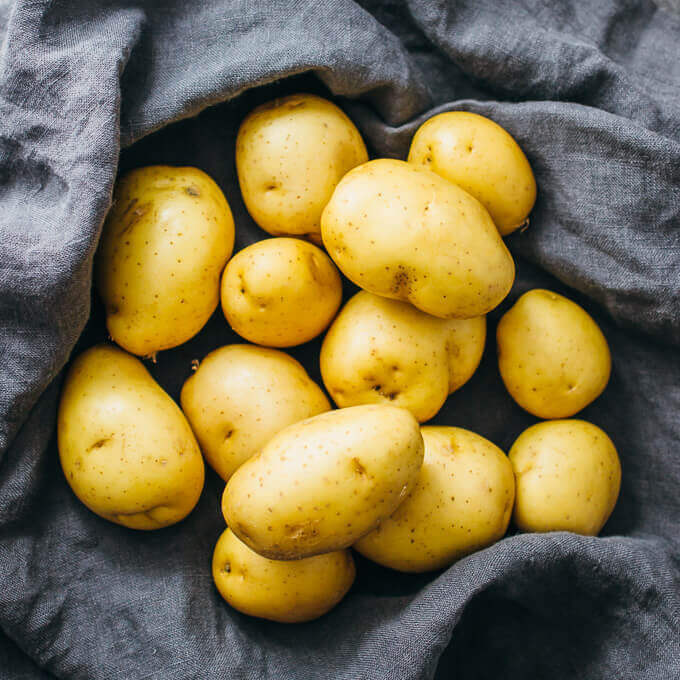 If you’re as obsessed with potatoes as I am, check out my most popular potato recipes: homemade french fries, garlic and basil mashed potatoes, smoked salmon potato cakes, and lemon basil roasted potatoes. 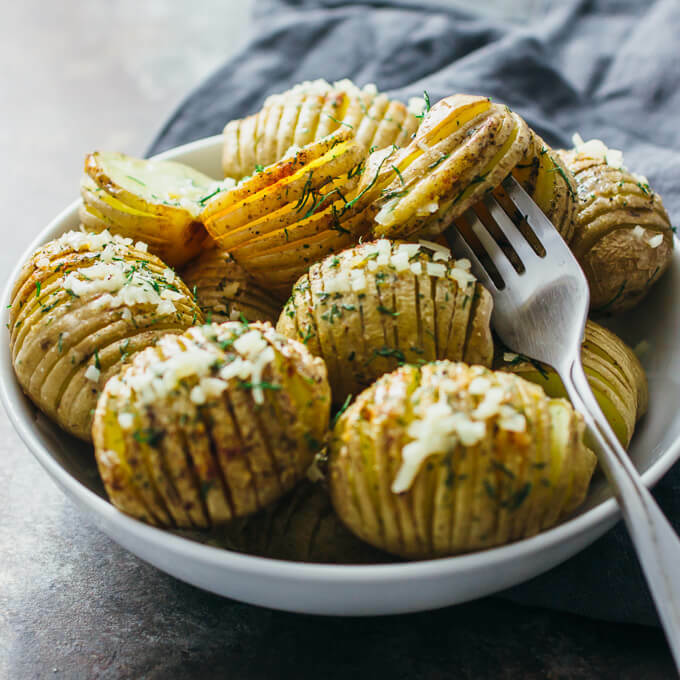 You’ll love these mini hasselback potatoes with cheese that are loaded with parmesan crumbles, herbs, cayenne (of course it’s spicy! ), and butter. For each potato, make 1/8-inch thick slices. Place a chopstick next to the potato, using it as a stopper, so that you don’t cut all the way through the potato. Place the potatoes on a greased foil-lined baking tray. Distribute over the potatoes: melted butter (easiest using a brush, salt, pepper, and cayenne. Bake at 400 F until the potatoes are tender, about 30 to 40 minutes. Remove the potatoes from the oven and apply more melted butter. 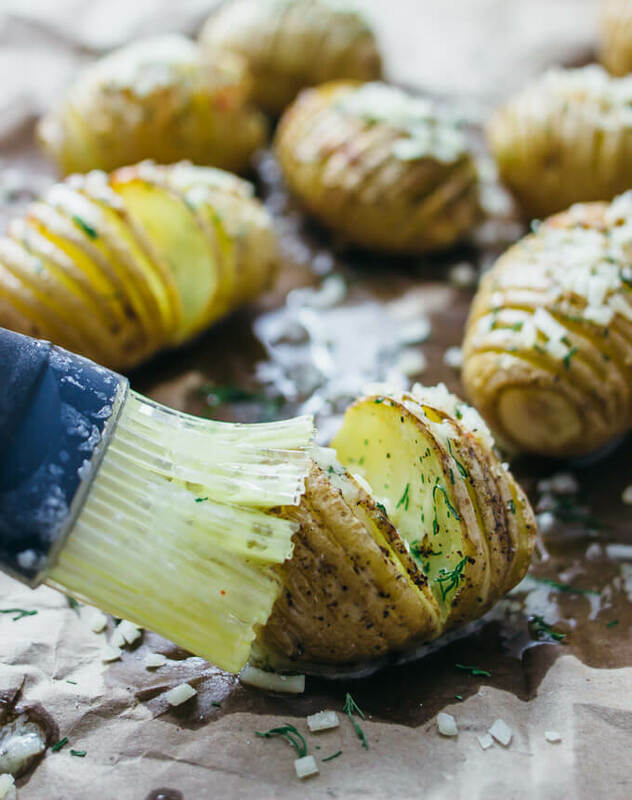 Sprinkle dill and parmesan cheese over the potatoes. Serve immediately. I love the name tassel tots! 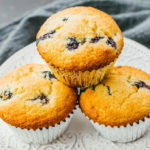 These good great and so easy to make. I am a sucker for garlic, so maybe I’ll use garlic butter instead of plain garlic. I can’t wait to give these a try! Oh my! These look divine! Gotta make them soon! Love the pictures!